Yahya Abdul-Mateen II Shows Off His Hot 'Aquaman' Physique! Yahya Abdul-Mateen II is talking about his hot bod! The 32-year-old Aquaman star, who plays the villain Black Manta in the movie, opened up in a post on Instagram on Thursday (December 20) about his physique in the movie. “Nearly 100% of interviewers want to know about THE SUIT! Well, when the Manta Suit weighs over 70LBS, you’ve got to make sure to take care of the REAL ENGINE inside of it!! Much love to @stuart_j_walton for helping me to build my best physical and (most importantly) mental physique. #Paperweight!! 📸 @jasinboland,” he wrote. See the hot pics below! Does 'Aquaman' Have an End Credits Scene? 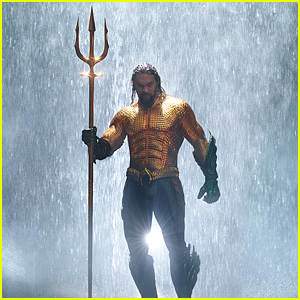 Fans will be flocking to theaters to check out Aquaman this weekend, and we have the scoop that there is additional content after the film ends! The DC Entertainment movie actually has a mid-credits scene, so be sure to stay in your seat once the movie ends. We won’t spoil anything here, but it looks like there could be an Aquaman 2 coming! Jason Momoa stars in the title role with Amber Heard, Nicole Kidman, Willem Dafoe, Patrick Wilson and more starring. If you missed it, Jason brought his whole family – including his kids – to his red carpet premiere this month! Jason Momoa Gets Support From Wife Lisa Bonet, Mom & Kids at 'Aquaman' LA Premiere! Jason Momoa is feeling the family love! 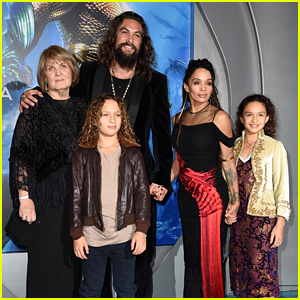 The 39-year-old Aquaman star was joined by his mother Coni Momoa, wife Lisa Bonet and their two children Nakoa-Wolf Momoa and Lola Momoa at the TCL Chinese Theatre premiere of his new movie on Wednesday night (December 12) in Los Angeles. Co-stars Patrick Wilson, Dolph Lundgren, Ludi Lin, Amber Heard, Nicole Kidman and Djimon Hounsou all hit the red carpet. Skylar Grey and Stephanie Sigman were also in attendance at the event. During the red carpet, Jason performed a haka dance – a ceremonial dance in Māori culture. Watch it here! FYI: Nicole is wearing an Armani Prive dress. Amber is wearing a Julien Macdonald dress and Ana Khouri, AS29, and Jacquie Aiche jewelry. Lisa is wearing Jacquie Aiche jewelry. Stephanie is wearing a Romona Keveža dress. 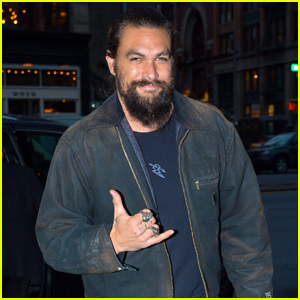 Jason Momoa is All Smiles Promoting 'Aquaman' in NYC! Jason Momoa is all smiles as he arrives back at his hotel on Friday (November 30) in New York City. The 39-year-old actor stayed warm in a leather jacket and jeans as he greeted fans after stepping out to promote his upcoming movie Aquaman. During a recent interview, Jason revealed the one major problem he had with his Aquaman suit. The first reviews of the upcoming DC Comics movie are in – and critics seem to be very positive! Check out their initial reactions to the film. Aquaman hits theaters on December 21! Jason Momoa Reveals Challenges Of His 'Aquaman' Costume! 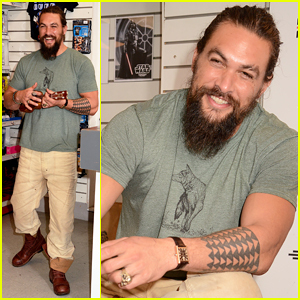 Jason Momoa is all smiles while attending a special fan meet and greet for his anticipated film Aquaman held at the Forbidden Planet on Tuesday (November 27) in London, England. The 39-year-old actor played the ukulele as a special treat before greeting fans alongside the film’s director James Wan. Jason recently sat down with Amber Heard to discuss the challenges that came with their intricate costumes for Aquaman. 'Aquaman' Early Reactions Are Very Positive - Read Them Here! The upcoming DC Comics movie Aquaman has been screened for some lucky critics and they all are very positive in their reactions on social media! The James Wan-directed movie just had its world premiere in London and lots of positive reactions are being released on Twitter. 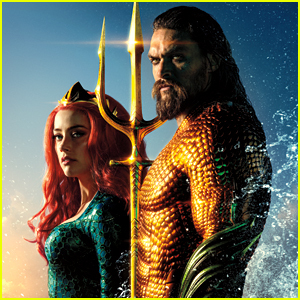 Starring Jason Momoa and Amber Heard, the film reveals the origin story of half-human, half-Atlantean Arthur Curry and takes him on the journey of his lifetime—one that will not only force him to face who he really is, but to discover if he is worthy of who he was born to be…a king. The movie hits theaters on December 21 and it sounds like it will be a big hit based on these reactions!